After much anticipation of these street’s anthems, it is now brought to end in Nigeria by the National Broadcasting Corporation (NBC) who had recently tagged Five Nigerian songs as “Not to be Broadcast. The NBC released the list of five banned Nigerian songs that wouldn’t be publicly aired in Nigeria again, either on radio stations or video club. 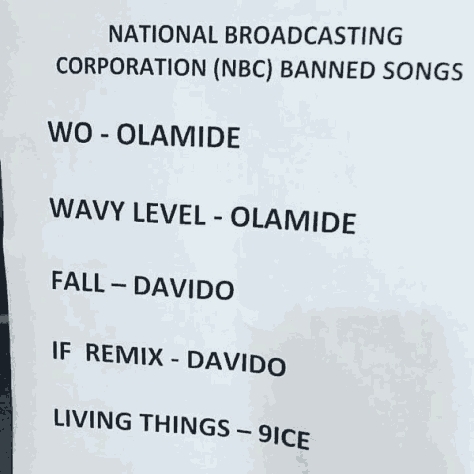 The five banned Nigerian songs by National Broadcasting Corporation includes two anthems from Olamide and Davido respectively and the last five from 9ice. According to Federal Ministry of Health’s tweet on Friday, the visual displays to Olamide – Wo! has violated the Tobacco Control Act 2015. Some months ago, precisely in June, Rapper Falz had also shown his bitter criticisms on the way Nigerian musicians embrace and encourage fraud with their lyrics. During his social media protest, one of the fans used that opportunity to labeled 9ice – Living Things as one of the songs corrupting Nigerians. President Buhari’s Full Speech After His Arrival From London – Must Read!